A Groundspeak Travel Bug* is a unique tracking tag that you can attach to items and give them goals for others to try and complete! The idea is that when you go Geocaching you hide your travel bug in a geocache for another geocacher to find. At some point another geocacher will collect your travel bug and move it to another geocache or pass it on to another Geocacher to hide in a geocache. Once a travel bug is discovered the geocacher that finds your travel bug will log the find on the geocaching website, this is where you can track the travel bugs movement and see where it travels too. Often you will find people have specified a challenge or mission for the travel bug hoping that geocachers will help the travel bug achieve that mission. Buy 5 or more travel bugs at our discounted rate! To learn more about the Groundspeak Travel Bugs, the Geocaching.com website or visit Geocaching Travel Bugs. Each travel bug comes as a pair; one bug gets attached to an item (or on its own) and the other is a copy that you can hold on to. Travel bugs have a unique tracking number stamped into the metal tag. 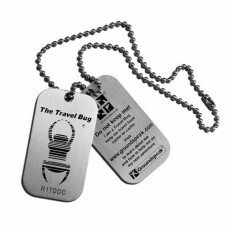 The travel bug tag was designed for durability and can be quickly identified by the official bug logo. Common mispellings include, travelbugs, travelbug, uk travel bugs & travelbugz.